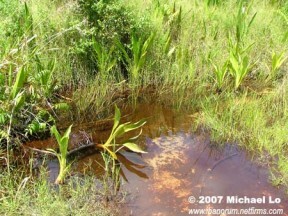 A typical habitat close to the Mandor River, West Kalimantan, Borneo. 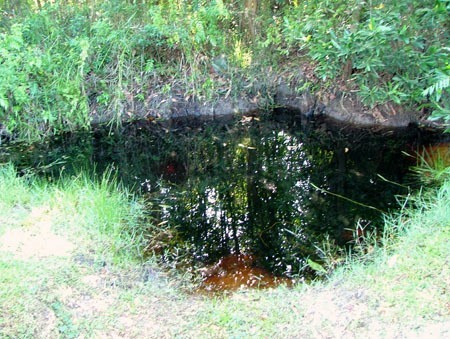 T. pauciperforatum and Rasbora cephalotaenia were also found here. At this locality near the city of Kuantan in Pahang state, Peninsular Malaysia this species was found living alongside Betta tussyae. Type locality is ‘Sungei Pinyuh, 8 kilometers southeast of Anjungan on road to Pontianak, 0°20’N, 109°08’E, Kalimantan Barat, Borneo’, but this species is widely-distributed in Peninsular Malaysia, Singapore, and the Greater Sunda Islands of Borneo and Sumatra. 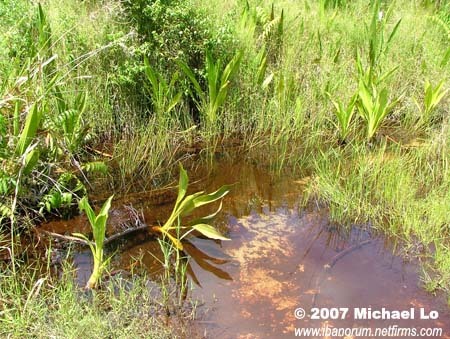 In Peninsular Malaysia it’s been collected in the states of Selangor, Terengganu, Johor, and probably other areas containing peat swamp forest, while in Singapore it may have been extirpated. In Sumatra it’s been recorded in the Batang Hari river system and on Natuna Besar, also known as Bunguran Island, one of the most northerly islands in Indonesia and part of the Riau Islands province. In Borneo the majority of collections have occured in the Kapuas River basin in the Indonesian provinces of West Kalimantan (Kalimantan Barat) and Central Kalimantan(Kalimantan Tengah). It also inhabits the Malaysian state of Sarawak but its range appears not to extend into the far north and east of the island. Minimum base dimensions of 75 ∗ 30 cm or equivalent are required for long-term care. An ideal addition to a peaceful community of Southeast Asian fishes with comparably-sized cyprinids, small loaches, and certain anabantoids perhaps constituting the best choices. 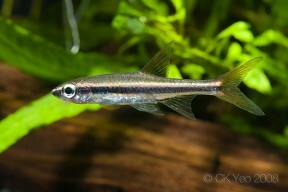 Some of the more commonly-exported species from Borneo include ‘Puntius‘ johorensis, ‘P.‘ hexazona, Brevibora dorsiocellata, Trigonopoma pauciperforatum, Rasbora eintovenii, and various Pangio spp., for example. Avoid boisterous or very vigorous tankmates as they may outcompete it for food. However if you want to maximise yield a more controlled approach is required. The adult group can still be conditioned together but a smaller aquarium should also be set up and filled with mature water. In either situation the adults will probably eat the eggs given the chance and should be removed as soon as any are noticed. These should hatch in 18-48 hours with the fry free swimming after 3-4 days. They should be fed on an infusoria-grade food for the first few days until large enough to accept microworm, Artemia nauplii and suchlike. This species occurs in several colour forms depending on collection locality with some exhibiting more intense pigmentation in the fins or an additional reddish lateral stripe, for example. 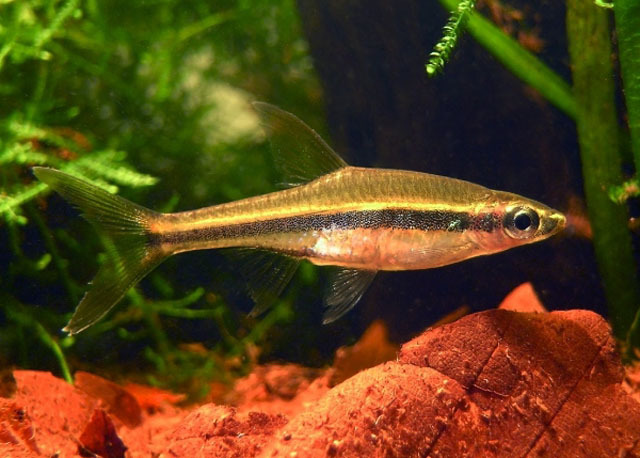 It’s sometimes said to closely resemble and occur sympatrically with Rasbora agilis, but that name is currently considered a junior synonym of its congener Trigonopoma pauciperforatum. R. agilis had previously been used to refer to a fish described by Ahl as R. taeniata and redescribed as R. gracilis by Kottelat in 1991 because the type specimens were found to represent a different genus. It was pictured in a 1971 book by Brittan labelled as R. agilis and this is probably where most of the confusion originated. It’s long been recognised as a polyphyletic lineage as noted by Kottelat (1999) among others, and in 2010 the results of a phylogenetic analysis by Liao et al. suggested a number of changes in order to improve the taxonomy. The authors found species of rasborin genera to represent a monophyletic grouping existing in six clades and erected four new genera containing former members of Rasbora in order to preserve monophyly of the existing groups. The first two of these clades contain new groupings Kottelatia and Brevibora, respectively. The third comprises Boraras, Horadandia, Rasboroides, and Trigonostigma, plus new genera Trigonopoma and Rasbosoma. However the results for Boraras and Trigonostigma were found to be inconclusive in some respects and further work regarding their phylogenetic position was recommended. Unfortunately many species weren’t included in the analysis leading to confusion regarding the correct placement of the 40 or so other Rasbora species, in particular. Though neither conclusion can be deemed 100% the system of Liao et al. is followed here on SF pending future studies, if only because we prefer to retain the familiar generic names Boraras and Trigonostigma. In addition, species described post-2010 are not included in the list above.